Alteration of central vision in macular degeneration. There is a strong relation between smoking and the presence of this disease. (Top photo: fundus of the eye. Left, normal macula. 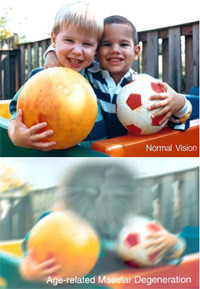 Right, macular degeneration related to age). Macular degeneration related to age or senile macular degeneration is a pathology that occurs in patients over 55 years of age. It is one of the leading causes of legal blindness. It is characterized by progressive damage to the macula, a small area in the center of the retina. This disease is more common in white persons. Patients suffering from this disease experience blurred vision or with shadows that, over time, create a blind spot in the central vision. Another feature is the distortion of images, which makes straight lines appear crooked. It may also affect color perception. There are two types of macular degeneration: the dry or atrophic form, which is the most common, accounting for more than 90% of cases; and the wet or neovascular form, of lower incidence, but greater severity. The only treatment available for dry macular degeneration is a diet with a high level of vegetable and fruit consumption, as well as the use of antioxidants like beta-carotene, vitamin C, tocopherol, and zinc. For the treatment of wet macular degeneration, intraocular injections of an antiangiogenic substance are used approximately every 4 weeks. The goal of this treatment is to stop vision loss, but it does not restore what has already been lost. In all cases it is recommended to quit smoking, due to the high relationship found between smoking and the presence of this disease.